We had Binyabasan na Talangka that my mom cooked. 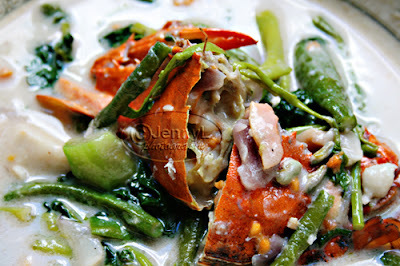 Crabs are cooked with veggies like Okra, sitaw, camote tops, gabi,) bayabas (guava) and with coconut milk (kakang gata). It is also sprinkled with some sugar to make it taste a bit sweet.. Mom already cut the crabs in half so that it'll be easier to open and for the sauce to get inside it. Awww yummy!!! Have you taste this dish before and do you know how to cook it?